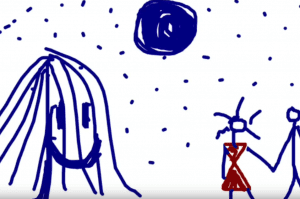 After is my first cartoon video-poem, which was hand-drawn in an iPad. It started with a feeling of longing for the evident object of desire at the time, Jack. The poem was transmuted from the raw intangible feelings that awake within our hearts. 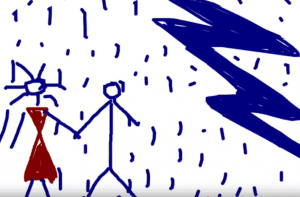 The poem in itself evokes a storm; hence, the background soundscape is a storm building up. It is a simple and child-like poem and it has very defined images, so I felt like drawing those images, or better say doodle them. The program I used is called cutecut, and is free to purchase in the apps of the iPad. I used the tip of my fingers to doodle the cartoony images. I also used a combination of perception tricks by flipping the slides upside down in short continuous brakes, as you can see on the raining images. 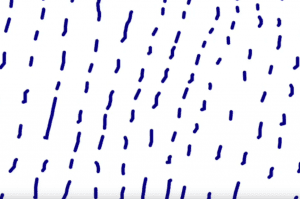 What looks like raindrops falling is the actual movement of flipping the drawings upside down over and over again. I did something similar with side to side flipping of the images. I recorded my voice on the iPad, since cutecut has a pentagram where you can upload the usual, voice recording, soundscape, text and self-drawn images. Below the silence after the storm.